And so I’m off! 2011 Business Plan? Check. Enthusiasm? Check. New ideas? Check. Let’s rock and roll, my friends. Will it all be blue skies and rainbows this year? Probably not. But on January 1st, we have card blanche. We’re free to grow in new ways, make new mistakes and learn from them, and dump out with Monday’s recycling what didn’t work last year. 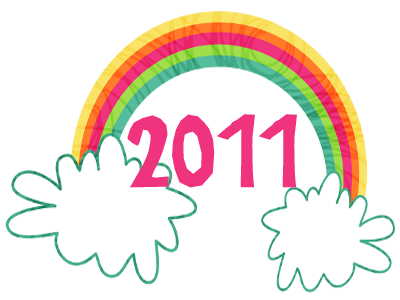 For the most part, I was on track for 2010. I had healthy, manageable goals and managed to achieve most of them. My business has always been cash flow positive. I closed the year with a profit. I built a web site, an online Etsy store, maintained quality products, provided fabulous customer service and delivered orders on time. I introduced the graphic design portion of my business and continued my education. All that’s pretty hunky-dorey. I am patting myself on the back. 1) Let go of managing all of the production. I have a wonderful production assistant who does an incredible job. My need to have my hands in all the pots is holding me back. 2) Network more. I managed to make it to 2-3 meetings a week, but in order for this ship to keep sailing, I must grow my referral base! 3) Offer more services. As my skill set continues to widen, I’ll be able to offer more graphic design and photo editing products. It’s paper and pixels around here! 5) Ask for referrals. I don’t know why I have a hard time doing this. I suppose it seems so … so… pushy? But that’s rather ridiculous, isn’t it? My customers, the ones who use my services and like them, are my best referral base. I’ll keep on keepin’ on. I have a few projects that I’ve been working on I’ll be posting soon and a few new ideas to share. In the meantime, peace, love and good wishes to you!